Re-Fuel(formerly Essentials for life) is a complete, powerful supplement that is a combination of 6 different natural products combined into one amazing system. It is also NSF Certified For Sports. Essentials for life includes all of the vital nutrients listed below. 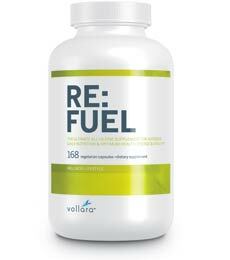 Complete whole food supplement that replenish essential nutrients for a healthy body. Minerals (Chelated Minerals ), patented chelated minerals with maximum absorption to promote energy, stamina, and a healthier you. Digestive Enzymes , vital enzymes necessary for proper digestion and nutrient utilization of foods. Antioxidants ( Super Antioxidant), potent antioxidants for complete protection against free radicals. Flora/probiotics , billions of stabilized flora to help suppress harmful bacteria. Fat Digesting Enzymes , specific nutrients for metabolizing fat and controlling healthy blood sugar levels. ** These statements have not been evaluated by the FDA. These products are not intended to diagnose, treat, cure, or prevent disease. Click here to purchase "Essentials"